I rarely get to watch Food Network cooking shows anymore, especially since the only thing they’ll play on air at night is Cupcake Wars and Diners, Drive-ins, and Dives. Bahhh. I was able to catch a glimpse of Giada making a citrus rice salad one day and it looked so fresh and delicious. Bookmarked it and decided to make it with Teresa a few months ago. 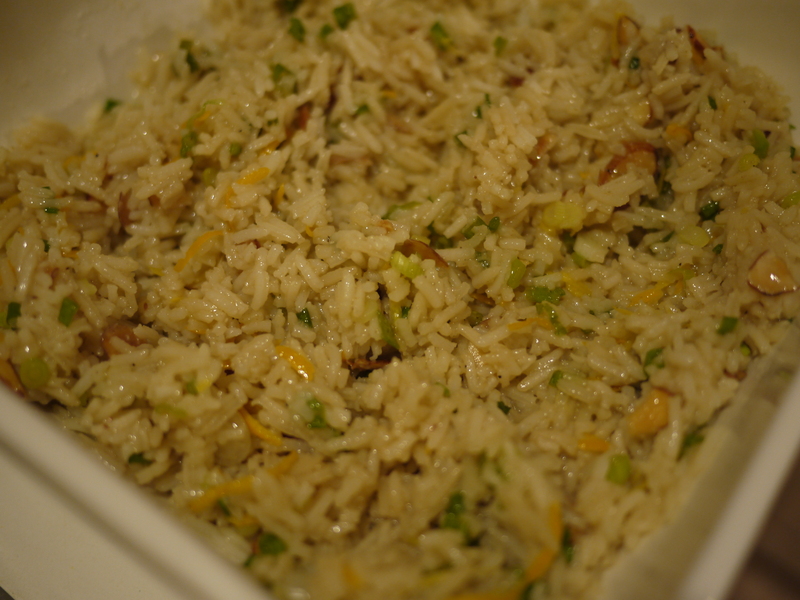 Rice salad: Bake the almonds on a baking sheet for 5-6 minutes at 350 degrees. In a medium saucepan, bring the chicken stock, salt, and oil to a boil. Stir in the rice, cover, and reduce the heat until all the liquid has been absorbed (about 40 minutes). Let the rice cool for 5 minutes. Afterwards, fluff the rice and place in a large orange bowl. Add the orange zest, lemon zest, green onions, and almonds. Toss well. Vinaigrette: Whisk together all the ingredients. Pour the vinaigrette over the rice mixture and stir well. The outcome was really good! Tasted like a citrus-y risotto.